Reader Toz Bourne pointed out that BeatHawk's sale today coincides with a major update! The app is now Universal and includes AudioUnit v3 support. There are a lot of other goodies in store as well! The update arrives with a whole bunch of new videos, and starts off with a showcase by Andrew Huang. Looks like a substantial update. I'm really considering taking the plunge on this especially with the current sale price. I already have a ton of other beat-making apps that I haven't really sunk my teeth into just yet however. Does anyone out there have an idea of what this might have or do differently as far as sounds or workflow than apps like DM1, DM2, iMaschine 2, iSpark, Elastic Drums etc.? Feeling the app overflow doldrums. Oh who am I kidding, I'll buy it. Well, apart from iMaschine, the apps you mention are more "drum machines" than anything. I use Beathawk mainly as a sound source. You can assign 16 different instruments/samples to the main pads, but you can actually play them all via midi routing on a keyboard, or via ModStep (or any sequencer). As you then can mix church choirs with jazz saxophones, drum loops with drum hits etc, I'd place Beathawk in another category than the drum machines, which are often quite specialised at what they do. Thus, if you are looking for a dedicated drum machine, you probably have it already (if you have the apps you mention...I do...) and this will not be better. If you are looking for a flexible multi instrument sound source Beathawk is, IMHO, better (though not as good for drum hits and their variations as the other mentioned options). A note to anyone considering BeatHawk: if you have Any passing interest in anything remotely MPC, step-sequencer and "16 pads" based there's none better than this. And that includes the iMPCs themselves. 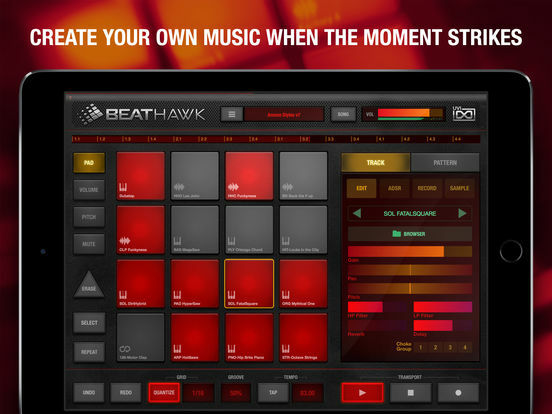 BeatHawk has incredible workflow, capability, stability and Sounds fantastic. Worth having for many times the asking price. It's fantastic. It sounds like Andrew is getting some velocity-based dynamics in his grooves. Is he programming that post recording, or do the pads themselves respond to contact size or X/Y position? I'd be curious to compare this to something like GB or MTS. I was surprised with the AU instrument functionality - when I would have thought Beathawk v2 would be an AU host. This is more than just a rompler or drum machine ... it's a neo DAW, kind of like Gadget, but with sound packs instead. I wrote a huge chunk of an upcoming song in Beathawk v1 - beats, synths, timeline, arrangement, etc. The only reason I output the stems (another feature I love) was to get it into Auria for some guitar, bass and vocals - the same thing I usually do with my Gadget compositions ..
Half of the Graphics are missing. Working with all the graphics. i am missing all the pads and every grey button. @Speeder, I just saw a review on iTunes that describes something similar. I wonder if that is a common bug. I know it is cheap, but it just seems like another app I'd like the sounds of, but just doesn't match my ideal way of working. I just want a good multi-velocity sampler. This does look like more fun than Gadget (for my tastes). Mannnnn, I was just about to give up on this app...but now I'm keeping it! being able to use this as an AU3 instrument is dope!